I remember being firmly told, when I was being taught how to paint in watercolours at school, that black was not something to use straight out of a tube. You achieved a huge spectrum of blacks by mixing other colours, such as reds and greens. Along the way, when learning of oil painters, there seemed to be some who historically used black in generous amounts, while others avoided its use in their work. 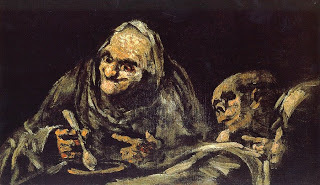 One of the most famous artists to be associated with black is perhaps Francisco Goya. His "Black Paintings" are somber indeed in their generous use of black, but, in this case, the subject matter is also associated with very dark themes. Goya painted this series of 14 paintings on the walls of his house, the Quinta del Sordo, outside Madrid when he lived there from 1819-1823. 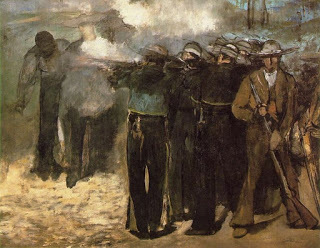 He was deaf by this time, he was afraid of going mad, and he had a very bleak view of humanity, having lived through the savage Napoleonic Wars and having watched the disasters of Spanish government. He painted these works without title, and by painting them directly on the walls, he clearly did not intend others to see them. This image, transferred to canvas from the wall of the house, was later titled Two Old Men eating Soup. Edouard Manet comes to mind immediately when I think of later 19th century artists who began to use black very effectively. He turned away from subtle modelling and simplified, even flattened, the images he portrayed. Not only did he outline in black, but in such paintings as the "scandalous" Olympia - a painting which seemed to shock everyone when it was first exhibited in 1863, his use of black was extensive. Like other contemporaries in France, Manet also was influenced by Japanese woodcuts, where the use of black was widespread and powerful. He continued his use of black even after he became close to many of the Impressionist painters. This is one of his three paintings of The Execution of Emperor Maximilian, painted in 1867. Again, his use of black is striking. When one thinks of artists in the 20th century who are noted for their use of black, Pierre Soulages is one artist who stands out. He began to concentrate on the use of black after 1979, and pushed the possibilities of black by manipulating the surface of the paint to enhance texture, reflectivity, character. 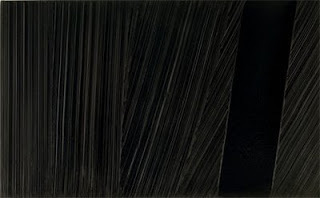 In fact, Soulages remarked that, "There are people who refuse to accept that you can create light on a black canvas." He calls his use of black outrenoir, ultra-black. He talks of black as being like another country, and has commented, "I like the authority of black. It is an uncompromising colour. A violent colour, but one that encourages internalisation. Both a colour and a non-colour. When light reflects on black, it transforms and transmutes it. It opens up a mental field of its own." At 92, Soulages is one of France's most noted artists, now linked inextricably to his huge opus of black paintings, none of which have titles. These are two illustrations courtesy of his website. Perhaps I have become more interested recently in the use of black in art because of my increasing use of black as a ground for silverpoint drawings. It is certainly a colour that arrests the gaze and transforms - I feel as though I too am straying into a totally different country with my silverpoints on black.